Side-projects are best experienced with an open mind, with little-to-no expectations based on the previous work of its members. They are often useful for musicians, in that they provide an outlet for previously unused musical ideas or allow them to express different aspects of their personalities, but they can prove disappointing to the audience when the work does not match the quality of previous results. So while it may be initially tempting to have high hopes for a collaboration between members of The National and Menomena, two of the best bands in indie rock from the past decade, it is probably in the listener’s best interests to approach their work with caution. 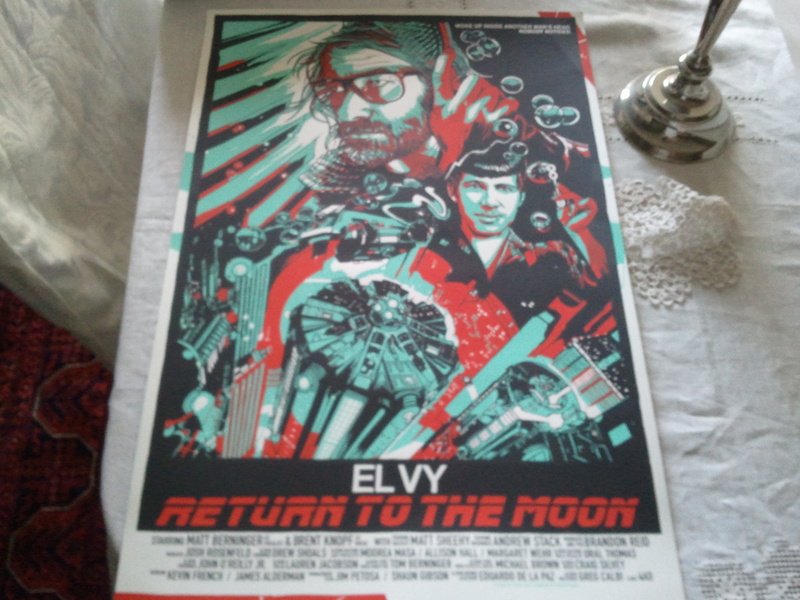 Then again, EL VY’s Return to the Moon is a thoroughly enjoyable lark, and fans of the other bands of Brent Knopf and Matt Berninger should find plenty to love with this project. In many ways, Return to the Moon is a side-project that lives up to the expectations of a supergroup, since in many ways it does sound like a more experimental Menomena record with guest vocals from The National. Knopf brings the cut-and-paste approach of his former group, offering up hundreds of quick musical ideas over the album’s eleven tracks; careful listeners may be able to pick out variations of the piano riff and acoustic guitar chords from “Wet and Rusting” sprinkled into a couple of tracks. The music generally sticks to that intimate indie rock style, but there are quick forays into funk and other left-field genres that keeps the listener guessing. Berninger seems to relish the chance to step outside the seriousness of his regular gig, and reveals a more playful part of his personality. This is most apparent in the playful and profane “I’m the Man to Be”, which includes a line in the chorus about his “person”. For the most part, Berninger is content to deliver his vocals with that trademark soothing baritone, which fits in nicely with Knopf’s compositions. The album tends to lose momentum as it progresses, though the blend of the harder-hitting “Sad Case” and “Happiness, Missouri” is a highlight of the second half. However, the opening title track is one of the catchiest singles of the year, and had me humming along for the past few weeks, and there are several other pleasant songs that are nearly its equal. 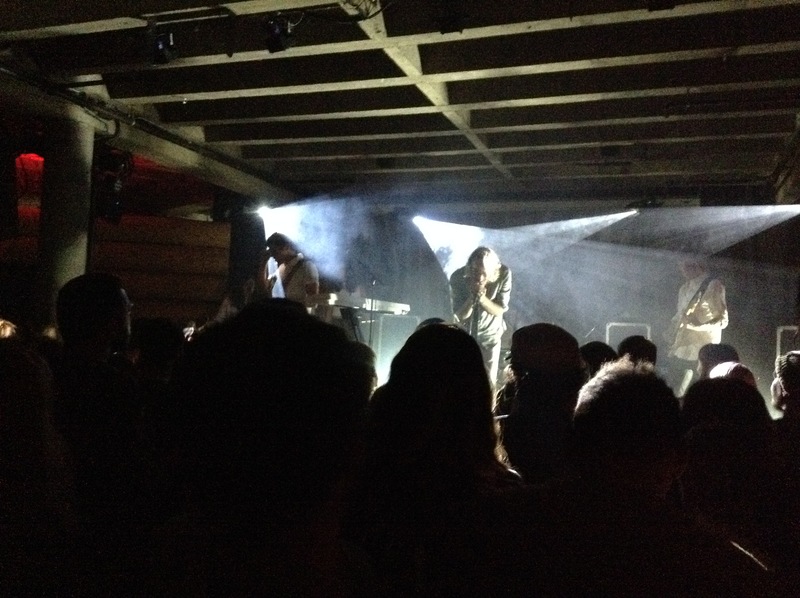 The show on Tuesday night had the atmosphere of a homecoming, even though it was only EL VY’s second show. Even the tickets reflected the casual nature of the evening, as it described the group as “a collaboration between The National’s Matt Berninger and Me.” The “Me” of course refers to local musician Brent Knopf, who has previously delighted Portland music fans with his previous work in Menomena as well as his solo effort as Ramona Falls, and now makes up the other half of this indie rock “supergroup”. While there were a couple of issues in making the transition from recording project to a functioning live act, they were only minor speed bumps during an otherwise entertaining show. One of the coolest concert posters ever. The band’s debut album Return to the Moon had only been released on Friday, and I am sure there were many in the crowd that had not been able to listen to it in its entirety before the show (my copy only arrived the afternoon of the show, so I was only able to get through it once). Nevertheless, the audience remained enthusiastic throughout the night, even if they had no idea what to expect. The crowd did show their appreciation for the few songs that they did know, with a few even having learned enough of the lyrics to sing along for a bit. Songs like “Return to the Moon” and “I’m the Man to Be” had an extra pop to them and were highlights of the set, and one could easily see why they were shared in advance of the album. The tone of the evening was very light and informal, and one could see that Matt enjoyed the break from the usual seriousness associated with his main gig. Matt had fun with Brent as he spent some time in-between songs trying to diagnose what exactly went wrong for a couple of measures, citing his own inability to remember his cue to sing for one and playfully arguing with Brent about how one of his chords caused him to overshoot on a vocal jump in another (and in the process showing the difference between recording alone to a track and singing with a live group). But for the most part, everything went as seamless as one could expect from a brand new group playing one of their first shows. EL VY also enjoyed the opportunity to play with some of their friends, as local musician Ural Thomas joined in to help fill in some of the background vocals he provided on the album, along with opening act Moorea Masa. But perhaps the best moment of the night was when the group selected an out-of-leftfield cover, the massive Fine Young Cannibals hit “She Drives Me Crazy”. Matt opted to bring Roland Gift’s falsetto down a couple of octaves, but otherwise the band captured the song perfectly, to the delight of many in the crowd. The lighting makes it seem so dramatic. Opening act Hibou were quite impressive, veering from the quiet and languid music that recalled Deerhunter to more epic, bombastic rock that would fit in perfectly fine at an arena and not a basement club. Moorea Masa has a beautiful voice, and the delicate harmonies that she produced with her fellow vocalists brought to mind a female version of Fleet Foxes. I am looking forward to seeing both of these acts swing through town again. This week we have quite a few videos to share, and not much else, so it should be pretty easy for our readers to have fun while expending a minimum of effort. First, we recommend that fans of The Black Keys take a look at The Arcs, the latest side-project from Dan Auerbach. The new group recently released their album Yours, Dreamily… and last week put out a psychedelic video for their song “Outta My Mind”, which recalls the recent work of Dan’s main gig, if a little more playful in tone. Speaking of side-projects, Matt Berninger (frontman of The National) and Brent Knopf (Ramona Falls, formerly of Menomena) have joined forces to record as EL VY, and the results they have shared so far are interesting to say the least. Their album Return to the Moon is not set to be released until October 30, but for now enjoy Matt having some fun in SoCal with the slinky “I’m The Man To Be”. Albert Hammond, Jr. of The Strokes is promoting his third solo album, Momentary Masters, and for the video of “Caught By My Shadow” he pays a bit of homage to The Seventh Seal with his chess battle with death. However, viewers are unlikely to confuse it with the Bergman classic, considering Hammond’s version involves way more special effects. If you are still in the mood for something strange, be sure to watch Viet Cong’s latest video from their self-titled debut, “Bunker Buster”, which features some bizarre visuals and a sci-fi storyline. The premiere of The Late Show with Stephen Colbert was the biggest news in entertainment last week, and among the memorable moments from the show’s first week was this amazing performance by Kendrick Lamar of a medley of songs from To Pimp a Butterfly. Be sure also to tune in on Tuesday night, when Run the Jewels are set to perform with TV on the Radio. And finally, if you are looking for something to satisfy your desire for lists, you might check SPIN’s look back to 1995 with their list of “The 95 Best Alternative Rock Songs of 1995”.